(0 Customer Reviews) | Write Review 2 issues per year Lavish Dulhan focuses on the modern bride and wedding, where South Asian tradition meets contemporary inspiration. Working with some of the best vendors in Canada, we are able to showcase the latest trends within the South Asian wedding industry to help the confident, classy and chic Dulhan of today. Our Summer/Fall 2014 issues is inspired by the Luxurious Traditions of India! Our team worked with Canada's best wedding professionals to create seven style shoots and two fashion shoots, that featured inspiration for the South Asian country. The magazine also features 8 real weddings and a recap of The Bridal Affair - Toronto's only Luxury South Asian Wedding show. Lavish Dulhan focuses on the modern bride and wedding, where South Asian tradition meets contemporary inspiration. Working with some of the best vendors in Canada, we are able to showcase the latest trends within the South Asian wedding industry to help the confident, classy and chic Dulhan of today. 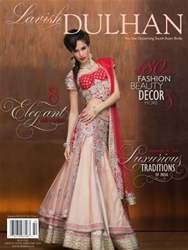 You'll receive 2 issues during a 1 year Lavish Dulhan magazine subscription. You'll receive 2 issues during a 1 year Lavish Dulhan magazine print subscription.